Easy home made meals. Easy home cooked meals are a cinch with the Red Copper 5 Minute Chef. The countertop electric cooker cooks your easy meals from the top and bottom simultaneously. Simply place your ingredients in the deep well and close the lid. In minutes your food will be ready to eat! The top and bottom wells are made of a strong nonstick, scratch-resistant copper infused ceramic. Your food won't stick! Cooking with a frying pan is messy. 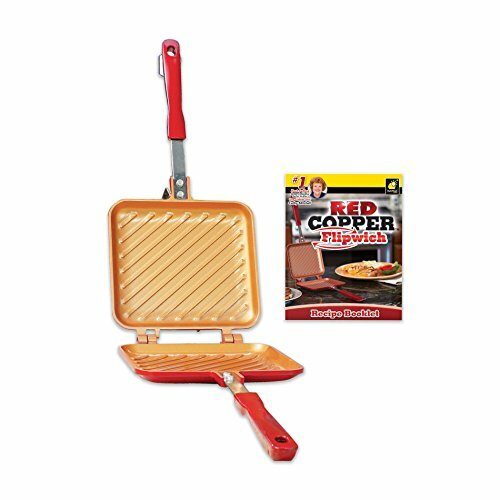 Red Copper 5 Minute Chef lets you cook easy quick meals without the mess and without the fuss. The meal maker for everyone. You can create home cooked meals in minutes with 5 Minute Chef. It's perfect for the dorm room and small apartments. 5 Minute Chef takes up minimal space on your counter or in your cabinets. You don't need a clutter of non stick cookware or an arsenal of culinary techniques for a delicious, nourishing meal. From omelets to dump cakes, 5 Minute Chef cooks meals in minutes. The outside of dimensions of 5 Minute Chef measures: 13 inches by 4.5 inches by 3.75 inches. The inside cooking wells measure 3.5 inches by 8.5 inches. What's included?5 Minute Chef Recipe guideSpatulaPackaging may vary. Item may not ship in retail packaging. Let 5 Minute Chef cook you a home cooked meal in minutes!.